This course focuses on the statistical and machine learning methods for predictive modeling available in the IMSTAT procedure. Topics include building candidate predictive models and assessing predictive models on training and holdout data for honest assessment using the IMSTAT procedure. You learn about methods such as decision trees and random forests using the DECISIONTREE and RANDOMWOODS statements. Modeling a binary response using the LOGISTIC and NEURAL statements is also covered, as is analyzing an interval target with generalized linear models using the GLM and GENMODEL statements. Generating and using Base SAS score code is demonstrated as well. Features of ODS Statistical Graphics are described for visualizing IMSTAT results. 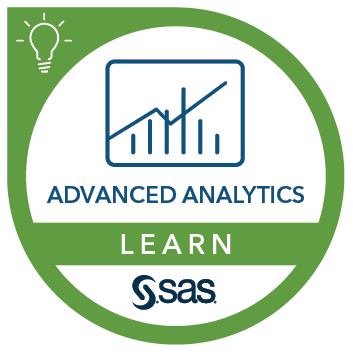 This course can help prepare you for the following certification exam(s): SAS Advanced Predictive Modeling. generate visual summaries of data using ODS statistical graphics. Before attending this course, you should have completed Getting Started with SAS® In-Memory Statistics. Other prerequisites are knowledge of and experience using the analytics methods such as binary logistic regression and decision trees. Understanding of predictive modeling concepts such as honest assessment on holdout data is also required. This course addresses SAS In-Memory Statistics software. The software version addressed is SAS LASR Analytics Server 2.5.